This listing is for a. 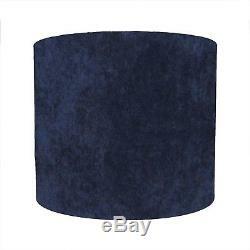 Drum lampshade hand rolled in a textured navy blue velvet with a brushed silver lining. Professionally rolled edge and lined with a rigid flame retardant materials. Available as either a ceiling lightshade or lampshade. Supplied with 40mm EU fitting with a 29mm converter disc for the UK. Use of a maximum 60w bulb recommended. Available in the following sizes. 20cm diameter x 20cm height. 25cm diameter x 21cm height. 30cm diameter x 21cm height. 35cm diameter x 22cm height. 40cm diameter x 26cm height. 45cm diameter x 28cm height. 50cm diameter x 30cm height. All lampshades are handmade to order, your order will be securely packaged and dispatched via 48 Hour Courier. 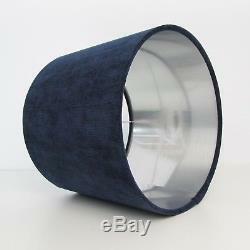 The item "Textured Navy Blue Velvet Silver Drum Lampshade Lightshade Floor Lamp Stand" is in sale since Sunday, April 8, 2018. This item is in the category "Home, Furniture & DIY\Lighting\Lampshades & Lightshades". The seller is "candidowl" and is located in Redditch. This item can be shipped to United Kingdom, Austria, Belgium, Bulgaria, Croatia, Cyprus, Czech republic, Estonia, Finland, France, Germany, Greece, Hungary, Ireland, Italy, Latvia, Lithuania, Luxembourg, Malta, Netherlands, Poland, Portugal, Romania, Slovakia, Slovenia, Spain, Sweden, United States, Canada, Norway, Mexico, Switzerland, Denmark.